Bought my fire pit three years ago .. still thrilled when we fire it up! Best quality and made right here in Georgia! We bought ours last summer and have used it dozens of times already. Everyone who comes over asks about it and the quality is superb. This is so much higher quality than anything. Love it!! This is our take on the Mid Century Modern Craze. Thanks to one of our customers for inspiring us to make one. It’s now a standard pit shown here in a 36″ size. Tough as nails. Good for medium groups (2-15 people), throw it in the truck for camping or tailgating or just impress your friends with it’s cool style. 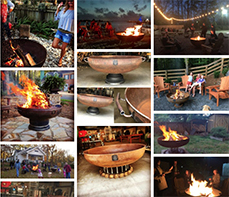 This fire pit sits approximately 18″ off the ground, has a 1/2″ drain hole to let water out and comes with one of our handcrafted 46″ fire pokers.